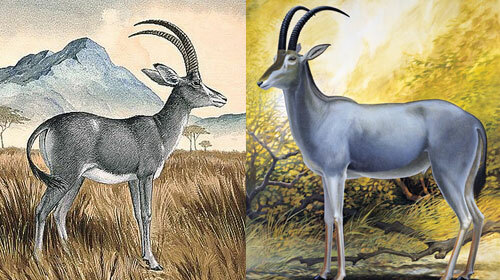 The Bluebuck is an extinct species of ‘blue’ antelope that was first encountered by European settlers back in the 17th century on the south west coast of Africa. It is believed that the species was in decline prior to the arrival of Europeans who relentlessly hunted the Bluebuck and turned its habitat into farmland. 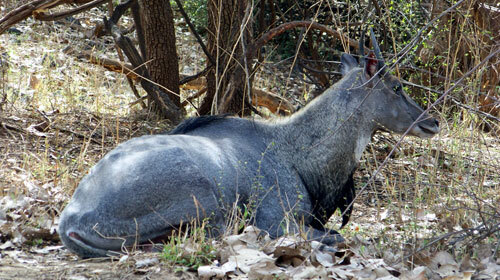 The Bluebuck is thought to have become completely extinct by the turn of the 18th century. Unfortunately due to the prompt extinction of the Bluebuck only a handful of specimens were acquired by museums and none of which show this ‘blue’ colored fur that gave the Bluebuck its name. It is believed that the blue color was either a combination of dark skin and thinning hair or that of mixed black and yellow hairs giving the Bluebuck a blue hue. The Bluebuck was described as a large antelope that was built like an English Horse. Described as have ears like a donkey and a strong, long neck with next to no mane. Although generally a blue/gray color the legs of the Bluebuck were long and white in contrast to the Bluebuck’s long black tail. The horns of the Bluebuck were scimitar shaped, similar to that of the Ibex and in contrast to the glossy blue fur the Bluebuck’s face was usually a varied brown color. There was no major distinctions between sexes, only that the females were generally smaller and more slender. The preferred habitat of the Bluebuck was that of grassland and marshes and this could be party due to the fact that the Bluebuck was dependant on plentiful water sources, although it wasn’t particularly bothered about fresh grass. Favorites of the Bluebuck are thought to have been medium to long grasses including spear grass and love grass. The lifespan of the Bluebuck is thought to have been around 18 years with females giving birth to usually one calf per year.